Large 150 x 203mm (6" x 8") pearl card with narrower deckle-edged front has pale sage background with oval picture of ivory-peach roses, trimmed with a cream bow. 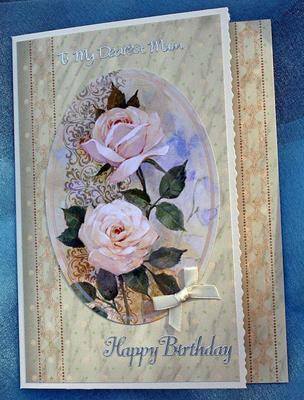 'To my dearest Mum' is written in silver at the top, and Happy Birthday is in silver at the lower edge. The printed paper insert reads 'With Love' but this can be changed to another option below.